I usually think of zinnias as summer flowers, but they’re really at their best once fall arrives. 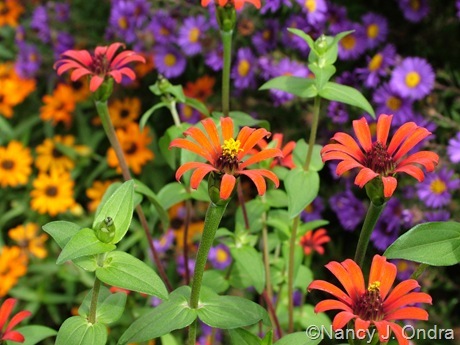 At the top of this post is narrowleaf zinnia (Zinnia angustifolia) with ‘Sweet Caroline Bronze’ sweet potato vine (Ipomoea batatas); above is ‘Red Spider’ zinnia (Z. tenuifolia) against New England aster (Symphyotrichum novae-angliae) and ‘Profusion Orange’ zinnia’. This is also peak time for some of the annual vines. 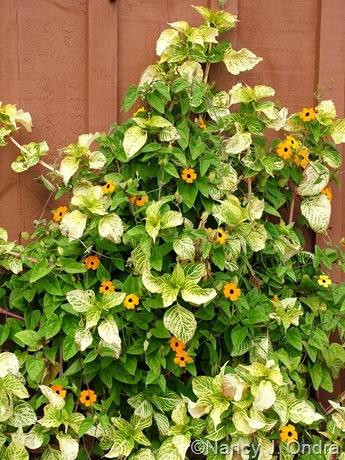 Above, ‘Whopper Orange’ black-eyed Susan vine (Thunbergia alata) has woven up through chicken gizzard plant (Iresine herbstii ‘Aureoreticulata’). 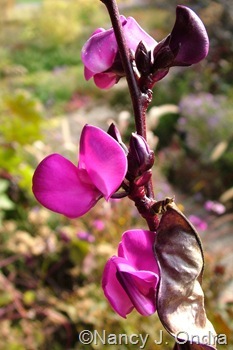 Below is hyacinth bean (Dolichos lablab). 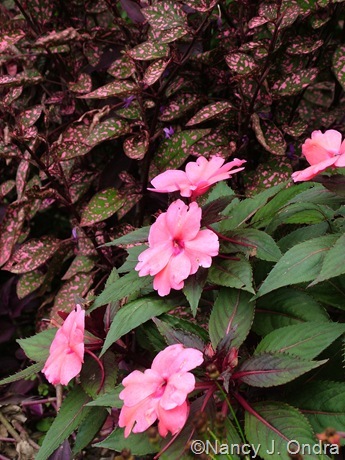 Above, ‘Sunpatiens Compact Deep Rose’ New Guinea impatiens with ‘Splash Select Rose’ polka-dot plant (Hypoestes phyllostachya). 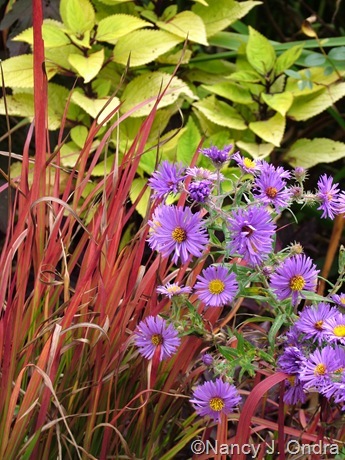 Below, ‘Hella Lacy’ New England aster with Japanese blood grass (Imperata cylindrica ‘Rubra’) and ‘Floricolor Gold Ring’ coleus (Solenostemon scutellarioides). 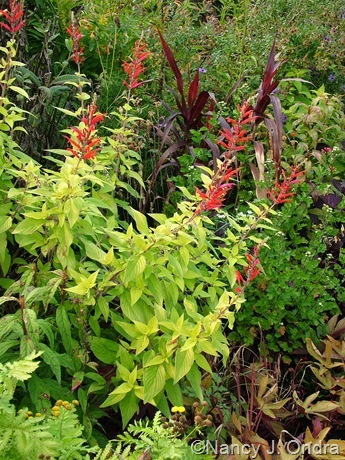 Above, ‘Golden Delicious’ pineapple sage (Salvia elegans) with ‘Burgundy Giant’ fountain grass (Pennisetum). 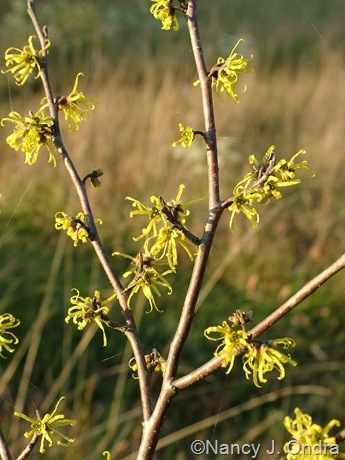 Below, common witch hazel (Hamamelis virginiana). 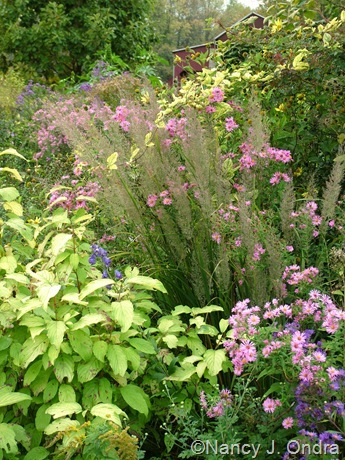 Above, Korean feather reed grass (Calamagrostis brachytricha), New England asters, ‘Sunshine’ red osier dogwood (Cornus sericea), and ‘Aureoreticulata’ Japanese honeysuckle (Lonicera japonica). 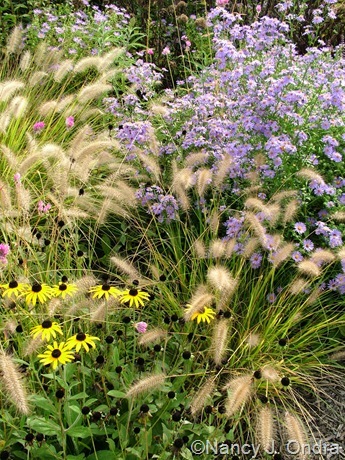 Below, ‘Cassian’ fountain grass (Pennisetum alopecuroides) with rigid white-top aster (Symphyotrichum retroflexum) and orange coneflower (Rudbeckia fulgida var. fulgida). 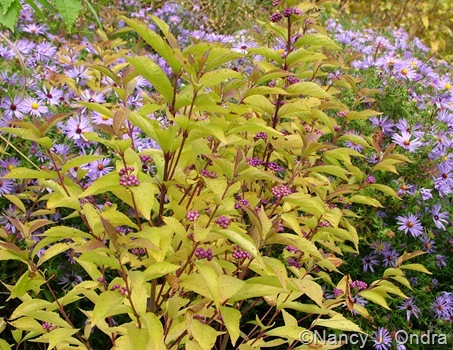 Above, ‘Issai’ purple beautyberry (Callicarpa dichotoma) in fall color with aromatic aster (Symphyotrichum oblongifolium). 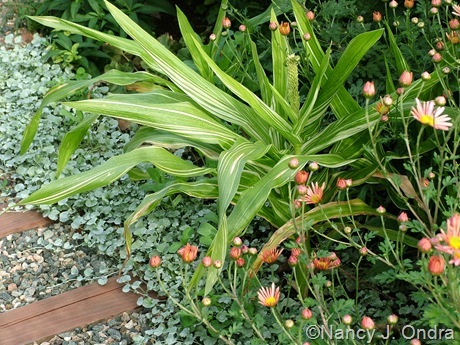 (There are many more plants with great leaf color right now, so I did a separate post for them at Gardening Gone Wild, in The Fall Color Project 2010 – Pennsylvania Style). Below, Tatarian aster (Aster tataricus). 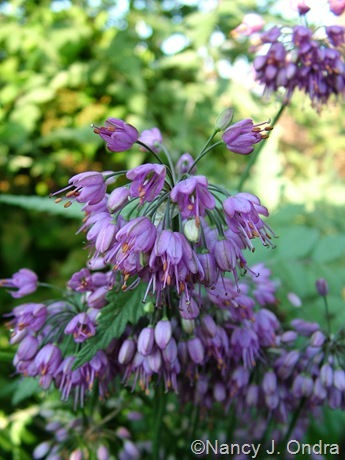 Above, ‘Ozawa’ ornamental onion (Allium thunbergii). Below, ‘Rosy Dawn’ autumn crocus (Colchicum) with creeping bramble (Rubus pentalobus) and a bit of ‘Angelina’ sedum (Sedum reflexum). Above, ‘Tiger Cub’ dwarf corn (Zea mays) with ‘Sheffield Pink’ chrysanthemum and silver ponyfoot (Dichondra argentea ‘Silver Falls’). Below, duncecaps (Orostachys iwarenge) – yes, appearing yet again this month, but this time in bloom instead of in leaf – with creeping rosemary (Rosmarinus officinalis ‘Prostratus’). 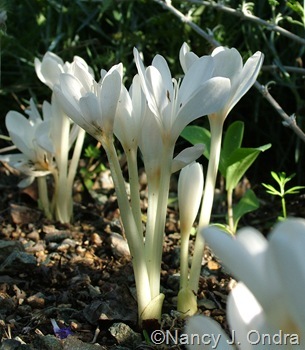 Above, white autumn crocus (Colchicum autumnale ‘Album’). Below, white-fruited Asiatic beautyberry (Callicarpa dichotoma ‘Albifructus’) with frost aster (Symphyotrichum pilosum). 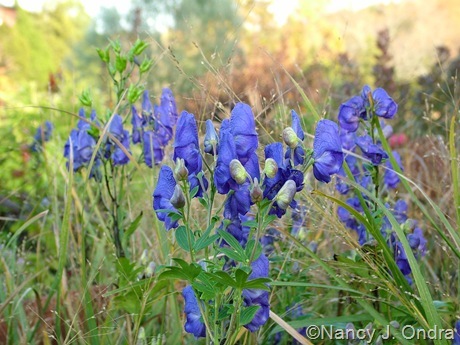 And finally, the star of the garden this fall: monkshood (Aconitum carmichaelii). For the last few years, cyclamen mites have been turning the buds and shoot tips black in midsummer and spoiling most of the bloom display. But this year, the plants managed to outgrow the damage and put on the best show ever. What a gift! It took a lot of restraint to choose only one photo to celebrate. Now, if you haven’t already done so, visit the main Bloom Day post over at May Dreams Gardens to find links to other fall gardens all around the world. Lovely photos as usual, but I were a bit confused. You call Colchicum for “autumn Crocus”!? But there are a lot of Crocus autumn species like Crocus pulchellus, C. sativus, C. serotinus etc. 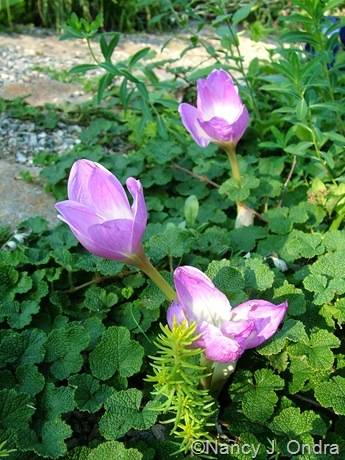 and Colchicum I think are called “meadow saffron”. Please correct me if I´m wrong! Anyway, it’s a good lesson on the value of using scientific names. Nan, some lovely plants and plant combination. I was delighted to see and purchase Sedum ‘Chocolate Ball’ and one called Winter Lemon (which similar to ‘Angelina’) last weekend. You featured ‘Chocolate Ball’ back in 2008, do you still grow it? I don’t have ‘Chocolate Ball’ here, Sylvia, but I can report that it did survive at least one winter outdoors with no protection, so it’s hardier than I thought. I hope it behaves well for you. The one thing I didn’t much like about the plants that overwintered is that they flowered heavily – so much so that the great-looking foliage wasn’t visible for a good part of the summer. Where to begin… above, below, in every picture I see a plant I want to grow in my garden. I’m grateful that you also garden in zone 5… it makes it fun for me to browse through all your bloom day posts and make a list for myself of what I want. Though it isn’t blooming, that dwarf corn has me intrigued. Thank you for joining in for bloom day! Uh oh, Carol – I’m actually Zone 6 here, so you might not have luck with everything I grow. But, luckily, I don’t plant too many marginal things: they need to be solidly perennial, or else treated as annuals. No matter the season, your gardens are always lovely, bursting with color and sparkling with little beauties. Never saw a white beauty berry, but I love it! The cobalt monkshood is one of my favorite colors. We’ve already had a couple hard frosts, so I’ve got dead foliage for a background, but it looks like you’ve escaped that fate thus far. Our frost date is usually around October 10, but we’ve been fortunate to squeak by with only a few nights of mid-30s. 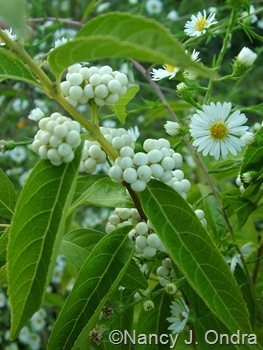 The white beautyberry is gorgeous when the berries are fresh; the disadvantage is that they brown quickly. What a beautiful display you have! 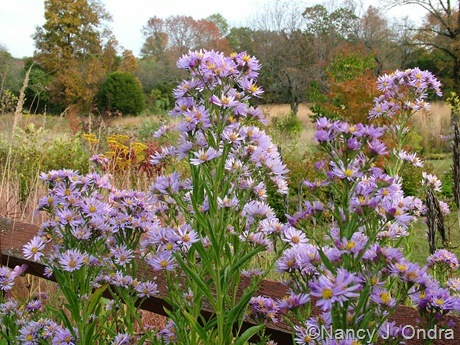 And I am amazed how you keep track of the different purple asters – they look the same to me ;-). Sometimes I had to go back outside to double-check the IDs, Lene. I know where the original clumps of ‘Hella Lacy’ are; I call the seedlings just New England asters, even if they look like the cultivar. The aromatic asters do look similar in flower, though they’re a bit bluer; their growth habit is much lower and bushier than that of the NE asters, however. Wow! Such vibrant colors. I love zinnas in fall also. Happy bloom day! Great to hear from another zinnia fan, Chris. Isn’t is great to have loads of them for bouquets this time of year? Such a wonderful variety of blooms. You have many lovely combinations. I’m so glad you stopped by for a visit. Happy Bloom Day! I always admire your selections of bloomers. You have the best combinations. Is the dichhondra an annual in your garden? I have brought in a piece of that during winter. It is such has such interesting texture and color. Every fall I wish that I have the fall crocus too. They are such sweet flowers. Happy GBBD. Hey, Lisa. The dichondra isn’t hardy here, but it has been self-sowing lightly for the past few years. wow, you are absolutely masterful with your plant combinations. I love every single photo! Witchhazel is one of my favorites. It’s always a surprise to see (and smell) witch hazels this time of year, isn’t it? The spiders seem to like them too; the plants were covered with their webs. Thanks, Phillip. Happy Bloom Day to you! Nan, your combinations are wonderful as usual. Your photos make me want to walk through your garden. I love the Frost Aster. Another plant to add to my “to buy” list. I need some white in my fall garden. Thank you! It might be tricky to find plants for sale, but I might be able to share some seeds. If you’re interested, let me know! I share your problem with taking too many photos. October is such a glorious month. I’m surprised your witch hazel has lost its leaves already. Usually, those blooms are hidden amongst them. I like the look of the Aconitum in amongst the grass. I’ve never thought to do that, as I treat mine like shade plants. Maybe they wouldn’t flop if I grew them in sun. The original clumps are in shade (or what passes for shade here). But as they’ve seeded around, they’ve put themselves in many sun-baked sites that I never would have tried. They do seem especially happy mingling with grasses for support. NAN — Your garden is beyond lovely! I could hardly tear myself away from that first image but glad I did. No one combines plants and colors with your skill and eye. You turned me on to a few new ones and made me see old favorites in a new light. Happy GBBD! Isn’t that orange-and-bronze combo interesting? It’s not something I would have tried on purpose, and I wasn’t crazy about it at first, but it’s really grown on me over the past few weeks. You’re growing witch hazel! Very cool. 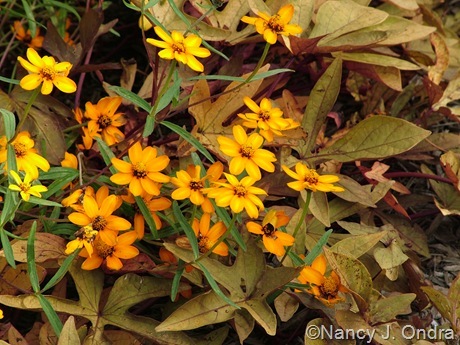 Your flowers are beautiful – it’s fun to see the mix of blossom color with hints of fall. Happy Bloom Day! Actually, the fall-blooming H. virginiana is native around here, so the one I added to my meadow is pretty puny in comparison. It’s an extra treat taking my alpacas for a walk this time of year, because some of the roadsides have thick patches of witchhazels, so free-flowering that you can smell them before you see them. Greeting, Noel. The hyacinth bean flowers were the plant’s main attraction this year, because for some reason, it didn’t set many pods. 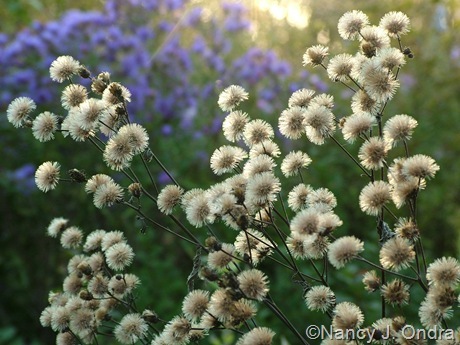 Your entire garden is beautiful, but nothing could be lovelier than those asters. What spectacular colour they lend to the fall garden! I’m glad that you enjoy them as much as I do, Nancy. I weed out loads of their seedlings each spring, but at this time of year, I’m always happy that I leave lots of them too. Nan, all of your combos are fantastic as usual. I especially love the pink asters poking through the calamagrostis… And I’m envious of your witch hazel blooming already – what a beauty. That corner with the C. brachytricha and the pink aster is one of my favorites this time of year, except that I always feel guilty about the variegated Japanese honeysuckle that’s there too. Wow, a cornucopia of color! You’ve got a lot going on there. Nice photos. Will have to check out dunce caps, intriguing! Aren’t they fun? 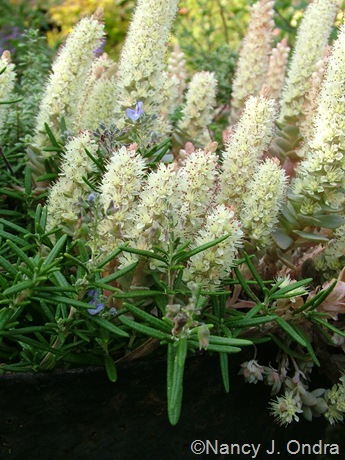 The plants themselves simply ooze charm, but I think they’re even cuter in flower. More than any other garden, yours gives me zone envy. But I suspect if you were in charge of my garden, you’d still make me wish I had your talent for combining plants. We need to come up with a new colloquial name for colchicums. How about autumn angels? That’s a pretty one, Kathy – much more marketable than “colchicums.” And thanks for the compliment, but I have no doubt that if your garden were the only thing you had to take care of, you’d have no trouble coming up with fun combinations. Your photography is stunning! That second photo looks like it could have come from a Disney theme park or animated movie. Or maybe a Photoshop session that got out of control – except that I take images directly from the camera, with no color correction or other changes (except occasional cropping). That’s all real, as-you-see-it-in-the-garden color! The color change on the beautyberry is one of my favorite features too: it really makes the berries stand out. What a great Bloom Day it was! What an abundance of beautiful fall blooms! I love the Asiatic beautyberry. It’s certainly well named, isn’t it? Such a gem for the fall garden. Thanks for stopping by, Layanee! I just LOVE your blog. Your plant combos are fantastic. I’ve written down many plants you’ve shown. I hope I can find the seed or plants next spring. Welcome to Hayefield, Melanie! If there’s anything you can’t find, feel free to leave me a note here. I’m always happy to share sources, or even seeds if I have them. I just discovered your blog and I am very inspired by your plant combos. Terrific use of color, texture and scale. Great use of Imperta- not too much and not too little. BRAVO! Welcome, Julie, and thanks! I kind of wish I had more Imperata, but so far I haven’t had much luck getting it established beyond two small patches. You’re probably right that too much would be overwhelming, though. Nan, I apparently missed your October Bloom Day post and am so glad I’ve now remedied that. No wonder you couldn’t stop taking your camera out to the garden. Such a beautiful autumn display you had! I could chat about each and every lovely photo, but will just mention how much I love the Aconitum. What a color! It makes a gorgeous fall display. I planted seeds from a blog friend last autumn but didn’t see any plants this past summer. Must try again! Oh, there’s one more combo I wanted to mention – the Thunbergia and Iresine. They make such a pretty pair. I’m attempting to overwinter a pink flowered Thunbergia in a basket. I cut it right back and it’s actually blooming in a south window. The monkshoods may surprise you yet, Kerri. If I remember correctly, they make only one or two leaves the first year and then go dormant pretty quickly. You may see them next year; we’ll keep our fingers crossed! Great idea to overwinter the thunbergia indoors. I love the flowers, but the vines take so long to bloom when grown from seed.